This week we have been exploring Viking history - this may seem a bit random to anyone who knows us as re-enactors. I think it's easy to take it for granted sometimes though that the kids absorb the historical information just because we take them along to events and they see the warriors and villagers dressed up, doing living history and re-enacting battle scenes. It's always a good idea to reinforce practical experiences with quieter reading and crafts at home and vice versa so that the kids get a chance to make the links in their heads between the things they've seen and participated in and the books at home. So this week we have been enjoying an Usborn sticker book which gives a scene with a little bit of information in text and then lots of stickers to add to build up the scene. I like it because both boys can help and it is a great way to talk through some of the concepts such as what homes were like, how people lived and, Ollie's favourite, what the toilet was like. It's also proven to be a good creative thinking springboard as I ask what Ollie thinks a particular person is doing and then he makes up stories around the scene. I've been strict at no more than one scene a day though as otherwise it descends into who can grab the stickers and mush them onto the picture quickest without taking anything in. From the local library we found another Usborn book - this time 'Pirate things to make and do'. 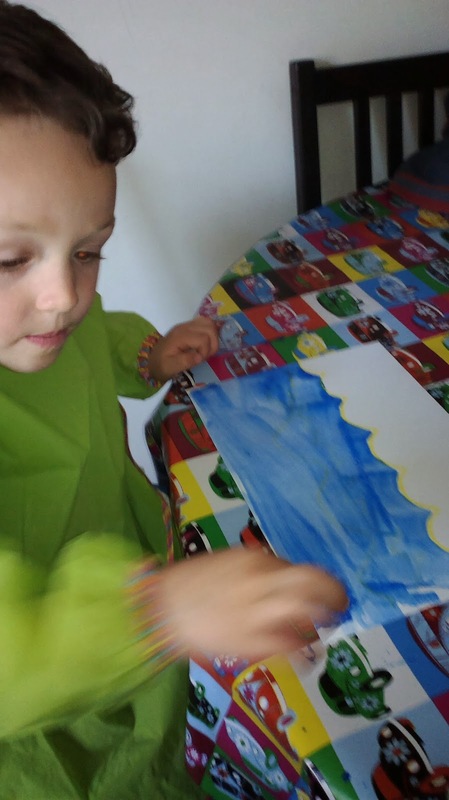 One of the activities was making a sea picture using wax crayons, paint and salt. I adapted it for our theme by helping Ollie draw a more Viking than Pirate looking boat. The first stage is to draw on waves with a wax crayon, then paint the paper with a blue wash - I watered down ready mixed poster paint. Ollie really likes covering a whole sheet of paper in paint without always seeming to have much more intention than using the greatest quantity of paint so he really enjoyed this. I used white card because I know how wet he likes to make paper. After the paint was on, both boys sprinkled salt over the sea which made a lovely 'watery' look that I'm not sure the photo captures. Finally a few drops of white paint in the sky to be smudged in as clouds, and a bit of red pen to finish the boat. 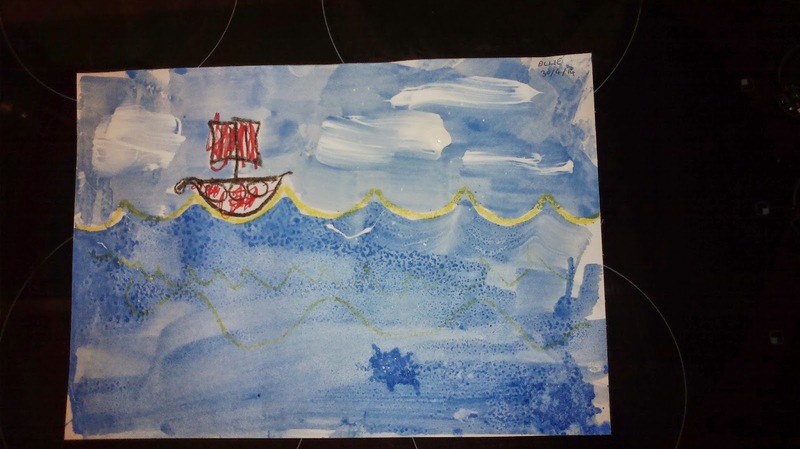 Ollie liked the way his sail was red and white like on the Viking boats in the sticker book. He also noticed that the tents in the sticker book and that some of our friends stay in on living history camps had the same pattern, which was a great opportunity to talk about how the sail would be taken down to make the tent when the Vikings wanted to camp somewhere. I love opportunities like this because getting an explanation for something they've noticed themselves is far more interesting for kids than just being told a load of facts. 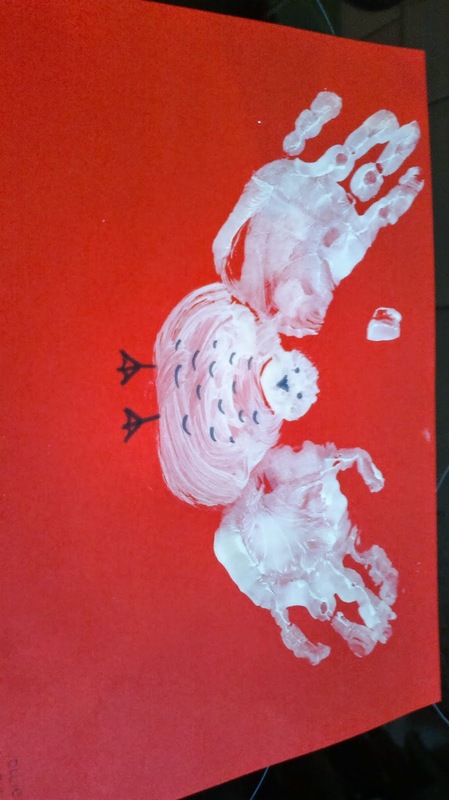 Finally we adapted the parrot activity from the Pirate crafts book to make a very chubby sea gull using white poster paint and Ollie's hands.